Dizziness, headache and fatigue may not be from a "bug" you've caught; instead, they might mean your home heating systems or appliances aren't operating properly. Carbon monoxide is a colorless, odorless toxic gas that can cause nausea, disorientation and even death. Children, the elderly, smokers, people with heart and respiratory diseases, and those with increased oxygen needs due to fever, hyperthyroidism or pregnancy are considered most susceptible. Carbon monoxide poisoning in pregnant women can cause birth defects. Usually, carbon monoxide safely exits a house through vents, flues or chimneys. If appliances or heating systems malfunction or are poorly maintained, carbon monoxide can remain in the home. Install CO detectors. Carbon monoxide detectors cost between $35 and $45 at most home supply stores and should be installed outside sleeping areas and near fuel-burning appliances. 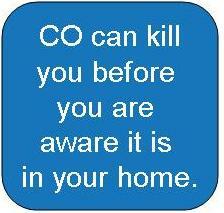 CO detectors should be installed in each bedroom and on each floor of the home. To be safe, have your home's appliances, chimneys and flues, and heating systems professionally maintained. Appliances and heating systems should be inspected annually by a qualified service professional. Anyone suspecting carbon monoxide poisoning should immediately leave the building and call 9-1-1.